This is the Real Deal. Pinot Noir made famous in the movie Sideways…the only Sideways about this wine is the price. 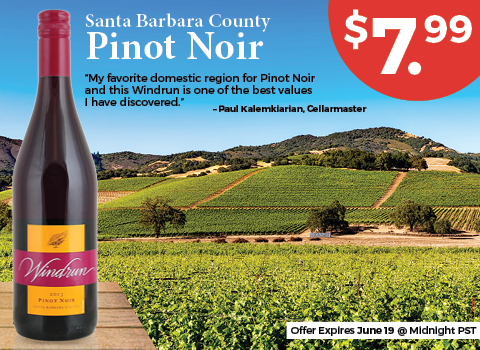 The folks at Windrun have been good to us in the past and we always look to taste their gorgeous wines...Here is a classic of theirs: the 2013 Santa Barbara County Pinot Noir. Folks, this is a pedigreed California Pinot Noir District...Santa Barbara County. Pinot Noir is all about the terroir. From California to Burgundy France, terroir is king with Pinot. Unlike any other grape, Pinot Noir reflects its growing conditions precisely. So, when they are representative of their respective districts…those are the ones I jump on. Here is a great deal on a great wine from a great district in a great state!! What else is there? GREAT PRICE!